In today’s IT world, our technological world has been swamped with a growing trend of increasingly digital manufacturing. Nowadays, it has become a real challenge for premise-based legacy systems to meet rapidly-changing consumer preferences and product development requirements. Now cue the drumroll: The silver lining in the cloud has arrived for manufacturing IT systems. Firstly, the cloud enables manufacturers to spend less time and money managing and upgrading their premise-based IT and more time growing their businesses. 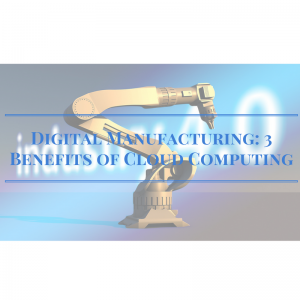 A cloud-based IT system is able to handle business processes as well as development and manufacturing. All without the risk of paying the high cost of internal IT infrastructure. Secondly, cloud software is repeatedly upgraded and proactively maintained for the optimal performance compared to its premise-based IT counterpart. Also, the Software-as-a-Service will help to retain the compatibility of your system’s processes with the industry’s requirements and regulations. Thirdly, corporate producers can react swiftly to the ongoing competitive pressure and market trends. Therefore, what the cloud does is it allows companies to expand operations and even open new businesses without having the complexity of expanding the IT foundation. Cloud computing provides true manufacturing agility with on-demand, real-time access to data and resources, reduced cost and risk, as well as marketing and production scalability. The flexibility of the cloud and the speed of deployment make manufacturing systems particularly well suited to cloud-based ERP solutions and supply chain management. This, therefore, allows for seamless, end-to-end business process and product integration. With all these discussions about process development and systems creation, there is a tendency to overlook the human factor in the big picture. However, cloud computing does provide workers with a positive impact. It also helps them to do their jobs better, faster and with greater flexibility. This is done by removing the static restraints of proprietary, premise-based systems. They have already included the cloud in their daily lives with the use of smartphones, Wi-Fi-enabled devices, mobile apps and other internet-powered tools. And so, cloud computing has made itself at home in our IT world and it is here to stay. Technology will continue to progress and evolve. For companies trying to keep up with the ever-changing, more complex IT systems the cloud seems to be a no-brainer solution. It will help you to stay afloat and competitive in any business market. Global ITN can implement cloud computing services for your business. Cloud computing is a type of off-site data storage complete with online business applications that makes retrieving data easier while providing cost savings and greater flexibility when adapting to technological changes. With Global ITN, we can provide a seamless and complete IT solution for all your business needs.